Isn’t it great that we can integrate? So, you’re spending a lot of time communicating about the changes you’ve made or the latest tweets that have showed up? Or maybe your engineers need a little bit more visibility into who’s committed what exactly and when? Why not try to automate some of the tasks to save time from having to go look for the information you need. To help you out with that we’ve got a couple of things to show you! Did you know that Fleep has integrations and a public API that you can build on? If you didn’t, then this is exactly for you. With our integrations you can create an easy to follow notification feed into your Fleep conversations so that you’ll have all the important stuff together in one place or in the right conversations. Look at what we’ve got! GitHub, Bitbucket and GitLab integrations to fleep about the changes in your repositories. For us, GitHub integration helps to keep the engineering teams in tune with what everyone else is doing at the same time. Zapier integrations to create different Zaps that send messages from Zapier into Fleep conversations. This one has multiple different usecases, we just tried out Twitter feed in the team. For those that love to track and analyze data there’s also New Relic and PivotalTracker integrations. And last but not least, JIRA and Confluence integrations, for those that are tracking incidents or bugs or simply love a Wiki on steroids experience. These integrations post messages about things that are happening in those environments, which helps to keep everyone in the same communication loop, which in the end… results in smarter collaborations. What if I need something more… advanced? For those of you that wish to build more complex integrations, the ones where you need more than a simple message post, you should go check out Fleep API. We have compiled together documentation to help you on your way. Should you need more help from a Fleep engineer to understand things, then don’t be shy to ask for help via Fleep Support. We’ll get you in touch with someone on our side! Hubot adapter for Fleep – Enables you to add a Hubot bot to Fleep conversations and stir up some fun stuff! FleepIRC - An IRC and Fleep integration for the chatty oldschool IRC nerds that just can’t pull themselves away from it. Flow - An unofficial Fleep client for Windows Phone 8.1. And if there’s something missing in the list of integrations that you absolutely need, let us know! Ping our Fleep Support chat and we will add it to our wishlist! How can I get started with integrations? Simple as that, open or create the conversation where you’d like to get the incoming messages in the future and click on the little gear icon on your right - Conversation settings. 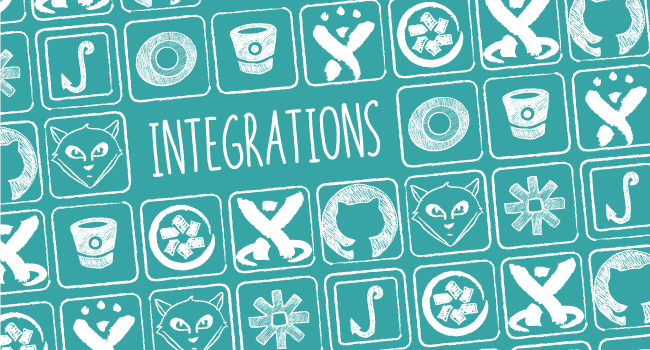 From there you’ll find another button called Integrations. From there you can choose which integration to setup and will also create a webhook. Further instructions on how to set up each of the integrations mentioned before are always available on our API & Integrations page. Go check it out!